Notes: Use precooked meat since you are just heating it up. 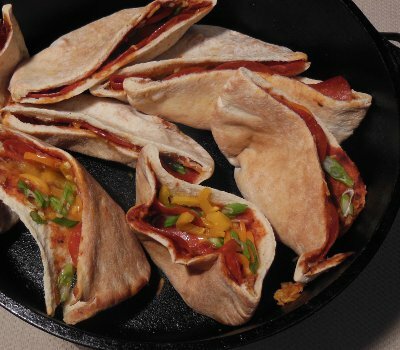 Instructions: Cut each pita bread in half to form two pockets and spoon pizza sauce into pocket spreading it evenly. Add 4 or 5 slices of pepperoni, 1 ounce of cheese, and other toppings. Don't overstuff it or it will tear. Repeat to make a dozen pockets. Stand the pockets up in the dutch oven. Put lid on the dutch oven and Bake at 350 degrees for 20 minutes. You can make these directly in fire coals by wrapping each pocket in foil and placing in coals. Cook for a couple minutes, flip, and cook another two minutes.